So today I want to write about all the stuff I've been meaning to write about all year. I'll probably just breeze over stuff more than I would have if I'd written in a timely manner, but I want to get it written down somewhere just so I don't completely forget years from now. I've been working at the paper all year, although only part-time for the second half of the year. I decided in the spring that I wanted to do more freelance work and I also started working at Jansen Products around June, designing websites and ads. I've designed five or six sites by now, I think, including Dishntunes.com, the biggest one. I'm also going to be redesigning some of the existing sites that are outdated. I feel good about the work that I've done there and I like the work a lot, especially since it's all local businesses that are really interesting. In March I wanted to write about Joanna James's farewell show in Minneapolis but didn't. It was amazing. She had a bunch of Minneapolis area musicians who made guest appearances, including Haley Bonar, Dan Wilson (of Semisonic), Marc Perlman (of the Jayhawks), Martin Devaney (whom I hadn't heard of but was really amazing), Chris Koza and Jessy Greene (who has played with the Foo Fighters and is Joanna's roommate now, I think). (One of the dudes from Dada opened with an acoustic set that was kinda boring; another classic rock/funk band played after that and got the crowd juiced up.) Joanna was in fine form, playing all her best songs, many of which come from her most recent EP Back of My Mind. The song "Disappear", which has some sad resonance with her departing Minnesota, is one of my favorite songs by anyone ever, seriously. Joanna left for LA to make the next step in her career. I haven't heard much but I think she's making a go of it. We were lucky enough to go to New York for a CrunchGear party on May 1 (we were in town a day before and a day after as well). It was my second visit to NY and I think Shannon's fourth. We stayed at Ted and Lorri's apartment across near the Lincoln Center, where once again we were visiting on the eve of a trip they were taking out of town. So we talked to them a bit that night and they were gone the next day, which was also the day of the party. It was a sort of Apprentice-like adventure that day when John (my editor) called me up and told me to get a vinyl sign made for the party, so I drew one on my laptop and figured out which Kinko's to get it printed and had it all figured out in time for the party. It was a fun time; they had video games and free drinks and gadget company reps with free stuff. Shannon was cute as a hostess who collected people's business cards for prize giveaways; she was much more charming than the CG dudes (me included) would have been. The next day we went to Brooklyn to hang out at John's house along with the CG writers ("dirty hippoes" according to John's son) along with my brother and his family. We wanted to see some friends of mine from Toledo who also live in Brooklyn, but we didn't get the chance to. Elkader experienced a devastating flood in June, which wiped out some downtown businesses and dozens of homes. Almost all the businesses have reopened, some in new locations, but some are gone completely, like the athletic club (a new one has since opened). We took some aerial photos for the paper. It was really tough for our friends who own a restaurant right along the Turkey River. I was really remiss in not posting about our nephew Mason's birth July 26. It was on the weekend of Sweet Corn Days here in Elkader, which is the town's big event (aside from the St. Patrick's Day parade). He's a really cute kid and I hope we'll get to see him often as he's growing up. We got to meet Mason (and see the rest of our family) in October when we went to Paducah for my aunt and uncle's annual Halloween festival, which I'd only been to once before, several years ago. More importantly, we were in town for my grandfather's 90th birthday party, which was held at the Knights of Columbus hall and five generations of family and many friends. I went to my 10-year high school reunion in Columbus at the end of August. We started a book club with one other person who is a much more voracious reader than we are, but we have fun getting together every couple of months (on average). A bonus is that our friend hosts us and makes these amazing vegetarian meals when we join her family for dinner before our meetings. So far we've read Love in the Time of Cholera, Life Class, Oryx and Crake and we're meeting this week to talk about A Confederacy of Dunces. We went to the Iowa State Fair with Shannon's family and had fun. We saw the Charley Daniels band. We've done some fun stuff with Frederique and Brian like go to Minneapolis to see the Frida Kahlo exhibit at the Walker and to New Glarus for a brewery tour. They tend to go to places for one single reason and sometimes we join them. They love this Thai restaurant we took them to in Minneapolis and have been back many times (we went just the one time). Our town got flooded, did I mention that? Needless to say we are uber-excited and can't wait till July. 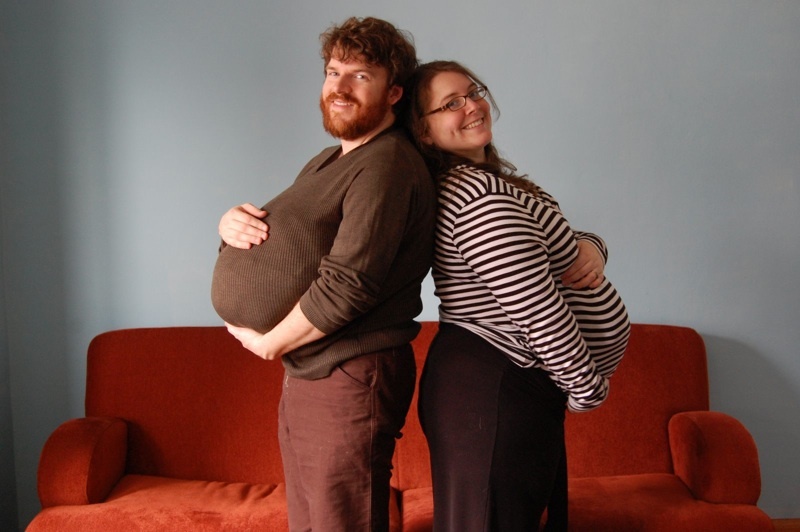 We are also excited for Phil and Teresa, who are expecting their second child a week after us. My problem is spending more time consuming media than producing it. There's so much cool stuff out there, but maybe there's some cool stuff in here too, I just need to take the time to find it. Looking over what I've written in the past, I don't think navel-gazing is my particular talent or calling, but I can use a blog as a vehicle for communication that is still a journal in a sense, that chronicles my life that will be interesting for myself and possibly others.